The area of North Belfast branded a "hopeless place" by Rihanna when she shot a hit video there is set for a wild flower makeover this summer. The pop superstar filmed much of the video for her 2011 smash hit We Found Love in the New Lodge, an inner city "concrete jungle" dominated by large residential tower blocks. Now as part of an environmental initiative led by the Royal Botanic Gardens at Kew, young people and residents will clear away foliage and weeds and plant an arrangement of native wild flowers. Stephanie Baine, Northern Ireland manager for organisers Grow Wild, said: "Grow Wild is all about bringing people together to brighten up forgotten spaces, and that is precisely what is happening here - which shows the New Lodge is definitely not a hopeless place." We Found Love became a UK number one. The imagery depicted the singer as a drug-abusing thrill-seeker in a relationship that quickly spiralled into addiction and violence. It was named video of the year at the MTV Video Music Awards in 2012. Rihanna shot part of the footage for We Found Love, a collaboration with British DJ Calvin Harris, in a muddy barley field near Bangor, Co Down. The filming was taking place close to a busy dual carriageway when she stripped to a bikini after removing a long checked dress. But the sight became too much for the landowner Alan Graham's Christian beliefs and he politely asked the filming to stop. 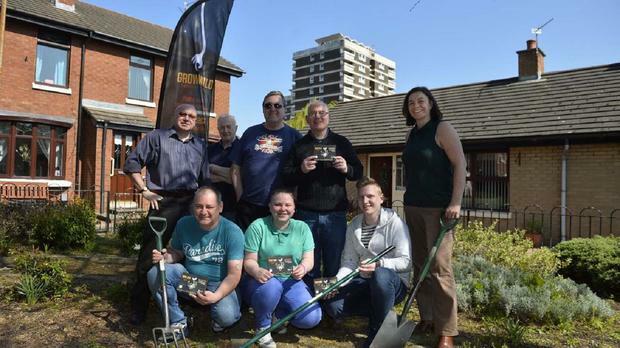 A local community group has received funding from Grow Wild, a project supported by the Big Lottery, for a flower-planting scheme aimed at brightening the urban area where the filming took place. Volunteers who have planned the Sow Wild New Lodge Community Garden will redevelop a unused and overgrown communal space in the area. Gerard Rosato, who is helping to run the project, said: "People are conscious that this area is a bit of a concrete jungle. North Belfast is very densely built up, there is a housing shortage and nearly anything that can be built on has been built on. "Any areas which can be transformed like this should be well looked after. My hope is that when this is a success we can get other, similar schemes off the ground and continue to spruce up the area." Supported by the Big Lottery Fund and led by the Royal Botanic Gardens, Kew, the New Lodge project is one of 12 community initiatives across Northern Ireland which have been awarded funding of between £1,000 and £4,000 by Grow Wild to bring people together to transform a communal space by sowing and growing native plants. Joanne McDowell, Big Lottery Fund Northern Ireland director, said: "We are looking forward to seeing how the wild flowers and plants will change this underused space, and make it a place that local people want to use." By Alex Green, Press Association Download Festival has announced that its 2019 event will feature a programme of mindfulness events.